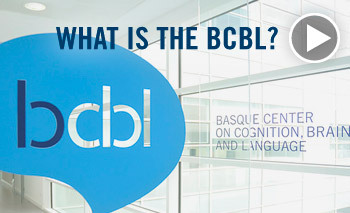 The Basque Center on Cognition, Brain and Language is a world class interdisciplinary research center for the study of cognition, brain and language jointly founded by Innobasque, Ikerbasque, UPV-EHU and the Government of Gipuzcoa. The center is situated in Donostia-San Sebastián in the Basque Country (Spain) and was set up in December 2008, when operations began to create the necessary research environment, including administrative and technical support and to recruit personnel, with a view to beginning on-site research in September 2009. “Language is the most unique human ability and involves complex cognitive processes. Reading and writing are the most impressive cultural developments of our civilization and are at the same time a major developmental milestone in each person’s life. They fundamentally change the way a person interacts with their environment. However, despite the impressive technological and scientific advances of recent decades we have not yet unravelled the complexities of the cognitive processes involved in language and in reading and we still do not know the causes of some language disorders and reading disabilities and how to remediate them.